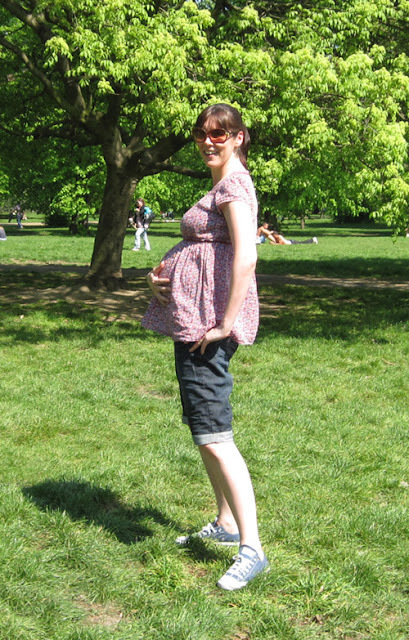 I ♥ Motherhood: Mamas and Papas Maternity Wear - Lucky Me! I've been lucky enough to be able to sample some of the new summer range of Mamas & Papas maternity wear recently and over the next couple of weeks I plan to show you some of the lovely things that the people at M&P sent me to try out! Me Rocking My Bump In Hyde Park! ﻿I've felt really summery and not at all frumpy. The cropped jeans (£28) are under the bump and have been perfect in this warm spring weather. The top (£32) is really pretty and Mamas and Papas also do a maxi dress in the same material. Over the next few weeks I plan to wear more of my Mamas and Papas clothes and show you just how good the range is, I'm most looking forward to 'showcasing' (love that word!) the maxi dress, it's gorgeous!